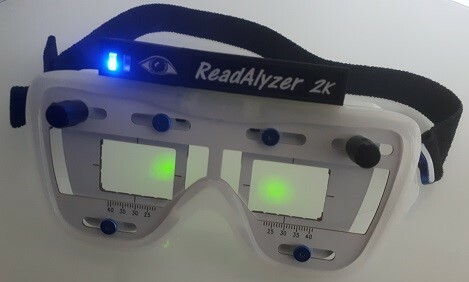 ReadAlyzer2K system, you can easily objectively measure reading skills. The system is particularly suitable for mobile use with laptop computers. The system uses infrared light for measurements and is designed to be safe under any condition. » Goggle material is TPE, a new material without softener that is in itself elastic. » System works with Windows 7, Windows 8 and Windows 10. During the test, the subject reads a text on paper from a text booklet that are available in several languages. You can also add your own texts to the system. Afrikaans, American English, Chinese, Danish, Dutch, French (not so many texts), German, Italian, Mexican Spanish, Norwegian, RSA English, Portuguese, Swedish. The ReadAlyzer2K is delivered in a plastic suitcase including one text booklet, one rechargeable battery pack and an USB A to C adapter for charging. There is space in the suitcase for one extra text booklet and one extra battery pack. We are really sorry for delays in production, but we will not compromise our system's quality. Our previous Visagraph, Visagraph USB and ReadAlyzer systems are not manufactured any more. We are currently looking into GDPR compliant solutions to enable our customers to get software downloads.